This new ten ounce silver coin is the second release in a brand new series of ten issues. Each of the ten coins in this new series will feature a heraldic animal of the British Royal Family. 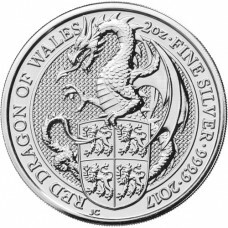 This is the second ten ounce silver coin released by the UK's Royal Mint. 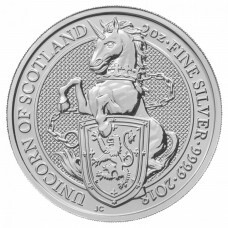 Contains ten troy ounces of .9999 fine silver. The second ten ounce coin minted at the Royal Mint in Wales. Each coin has a £10 legal tender face value in the United Kingdom. Obverse design features a new portrait of Queen Elizabeth II, updated for 2018. Reverse design features a griffin, England's most famous heraldic creature. Second of ten coins in a new series. Coins are shipped in a protective plastic capsule. 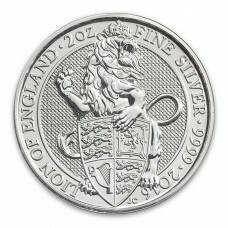 These are official sovereign silver coins guaranteed by the British government. You can find also other official United Kingdom Royal Mint coins available here. In 1536, the infamous King Henry VIII commisioned the carving of ten stone sculptures in honor of his marriage to Jane Seymour (they were engaged the day after the execution of his previous wife, Anne Boleyn). Each of the ten animals depicted in the sculptures represent the heraldry of different branch of Henry and Jane's respective ancestries. These sculptures - the "King's Beasts" - stand to this day on a moat bridge at Henry VIII's primary English residence, Hampton Court Palace. In advance of Queen Elizabeth II's coronation in 1953, some four hundred years later, a similar set of sculptures were commissioned. These sculptures also depicted the different mythical creatures representing the various branches of Elizabeth's family in the heraldic system. The sculptures themselves were plaster, not stone, and are now on display indoors at a museum in Canada. Stone replicas are on display in Kew Gardens, London. This new series of coins from the Royal Mint honors these ten mythical creatures: the Queen's Beasts. In addition to a ten ounce silver coin, a two ounce silver coin, a 1/4 oz gold coin and a one ounce gold coin will also be produced for each of the ten animals in the series. 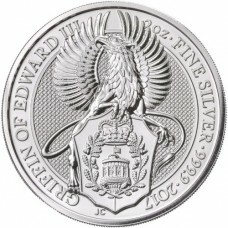 This coin, featuring the English Griffin, is the second in the series. The Royal Mint is one of the oldest and most well-respected national mints in the world. The purity, quality, and collectibility of these coins make them an excellent investment choice. All orders from Monument Metals are shipped discretely, insured fully, and the products are guaranteed to be as described. As low as $2.89 per ounce over spot!